They say music soothes the savage beast. By that rationale, a good set of dulcet tunes should calm down even the feistiest of dogs. And several companies out there bank their existence on this philosophy by creating calming music specifically for pooches. But how effective are they? When your dog suffers from separation anxiety, he may let you know in several unpleasant ways. He may try to cope with this condition through destructive behaviors like chewing, pooping, or peeing. Sometimes, he may resort to excessive howling or barking to soothe his nerves. Canine-specific music is designed to quell this behavior. Through peacefully arranged music built around simple melodies and a minimal amount of instruments, these tunes can specifically connect with the way dogs process audio, which is much different that the way it’s processed by us. In other words, dog music is carefully constructed to be built around the type of pitches and tones that calm a pooch’s nerves. How Does Dog Calming Music Made for Dogs Sound Like? Canine specific music will feature a lot of sounds that a dog may easily find in nature or in his environment, such as water, crickets, rustling wind, birds, and voices. Interspersed with these comforting noises is ambient music that features simple, repetitive patterns. In a way, it’s kind of similar to the ambient tunes designed for humans. The Music Sounds Great and All, but Does it Work? According to various avenues of scientific research, there seems to be a positive correlation between music calming down dogs. The research does suggest that the tunes that work the best are ones that feature long, extended notes, slower tempos, and purer tones. On the other side of the coin, studies tend to show music that is loud, fast, and furious tends to freak our furry friends out (sorry, metalheads). If you're a bit skeptical or hesitant about shelling out a bunch of money to pick up ambient music sprinkled with nature noise, you don't necessarily have to to achieve the effect. Studies have shown that classical music can do the trick, providing them with a sense of comfort as it lowers his anxiety. It has also been shown that canines that connect to their inner Chopin have a greater tendency to be in a resting state longer and bark less when compared to other pooches. If the right kind of music can calm down your nervous dog, then it’s only natural to assume that these tunes can also help put your pooch to sleep. This is indeed the case according to various forms of research. The principles behind this work are not just scientific; they are environmental. Dog calming music isn’t concerned about creating a beat that is easy to dance to. Rather, they are built around the concept of creating an auditory environment that lets the dog know that he is safe and everything is normal. These sounds, in turn, trigger a relaxation response in pooches, which could be instrumental in helping your four-legged friend wind down and conk out at the end of the night. Being able to connect to specifically designed music is not the only reason to marvel at your pooch’s auditory talents. 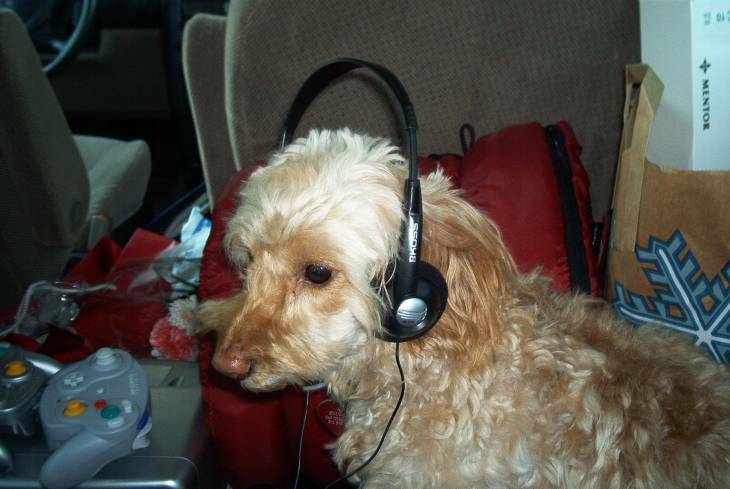 In fact, one of the coolest ways your pooch can demonstrate that he has an ear for music is through his vocal talents. Specifically, he can show off through his ability to howl. Research has shown that dogs do indeed have a sense of pitch. Furthermore, they can be encouraged to howl to meet the pitch of a long note stemming from an instrument. While you may not think of it like singing, you might consider it to be a cool little trick to show off at parties. Ultimately, the calming principles that exist behind the right kind of music can help your dog be better behaved and more obedient. These metrics can, in turn, help to strengthen the bond you have between you and your pooch. And that's really music to anybody's ears.